Nancy A. Collins is the author of numerous horror, dark fantasy and comics stories. 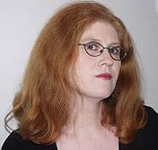 She is a recipient of the Horror Writers Association’s Bram Stoker Award and The British Fantasy Society’s Icarus Award, as well as a nominee for the Eisner Award, the John W. Campbell Memorial Award, and an International Horror Guild award. A native of Arkansas, she currently resides in Cape Fear, NC. Here’s Nancy Collins’ MySpace page. Tate, a young New York artist, needs a new apartment right away. She makes metal sculptures out of car parts and other odds and ends, and it seems her landlord isn’t too happy with the noise level. Tate discovers an available room at a reasonable price and jumps at the chance, even though the building is in Golgotham, New York’s magical neighborhood. 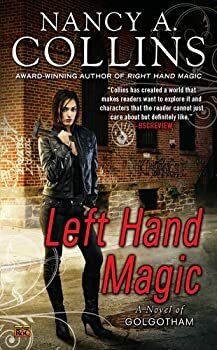 In Left Hand Magic, Nancy A. Collins delivers a satisfying follow-up to last year’s Right Hand Magic. Tate Eresby, a trust-fund baby turned avant-garde sculptor, is still living in the rich setting of Golgotham with her Kymeran lover, Hexe. But new troubles are brewing in Golgotham. A magazine spread has made Golgotham a hip hot spot for human tourists, and racial tensions are growing between these tourists and Golgotham’s magical natives. The racism that Collins depicts is, sadly, all too realistic and plausible. It threatens to tear apart the relationship between Tate and Hexe, as both are seen as race traitors. But it’s far worse than that too: bullying, then rioting, then murder take their toll on the neighborhood. Some of the victims are characters we’ve already met and liked, making their fates hit harder. Sonja Blue — (1989-2002) Publisher: A debut horror novel featuring a vampire, Sonja Blue, who escapes from a mental hospital leaving a trail of corpses in her wake. As we learn about her early life, we are taken on a nightmarish tour of a world inhabited by other types of non-humans – ogres, zombies and, of course, vampires. Vamps — (2008-2009) Young adult. 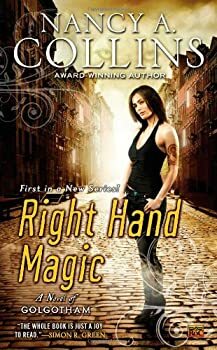 Publisher: When the sun goes down, New York’s true elite all head to one place: Bathory Academy, where the young ladies of the finest vampire families are trained in shapeshifting and luring their prey. Bathory’s reigning queen, Lilith Todd, is the daughter of a powerful vampire businessman, and she knows exactly what she wants from life. She wants to look beautiful for eternity and party till the sun comes up with her gorgeous boyfriend, Jules. And she doesn’t want any New Blood upstarts standing in her way. Enter Cally Monture, an unexpected threat from a trash zip code. When their first meeting leads to tragic results, Lilith is hungry for revenge. CLICK HERE FOR MORE TITLES BY NANCY A. COLLINS.